9M FY17 PATMI met 74% of our full year FY2017 expectation. O&G and Dermatology was weaker than expected. Continued strong performance from the Cancer-related segment. Its 9M17 Profit from operations more than doubled to S$0.64mn with margin +8.8pp to 23.7%. Maiden contribution from the Paediatric segment with one clinic at Parkway East Medical Centre. 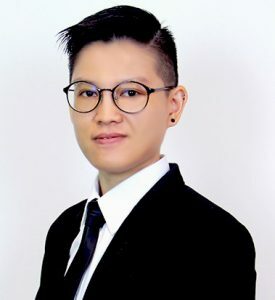 Dr Lim Xue Yan, the new Paediatrician, benefits from the patient referrals from the two SOG clinics under the same Medical Centre. Currently, all her patients are via internal referrals. As Parkway East Medical Centre houses the Group’s top two Obstetricians, we expect (a) a secured patient pipeline to feed into the clinic; and (b) to breakeven by 1Q18 and start contributing to the Group’s bottom line by FY18e. 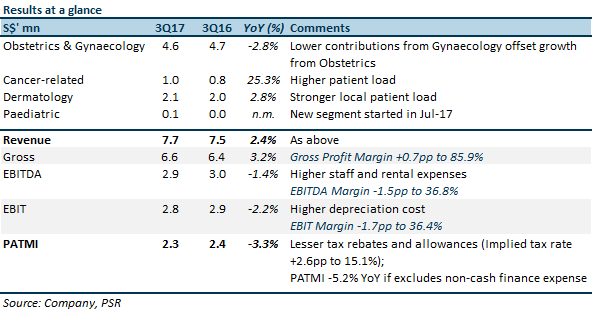 9M17 O&G grew at marginal 1.2% YoY, weighed by slower Gynaecology in 3Q17. Nonetheless, we take comfort that the YTD market share for Obstetrics is stable at 4.2% of Singapore’s total birth, same as FY2016’s. SOG delivered 1,237 babies in 9M17, -2.4% YoY, vs -4.8% YTD YoY in overall Singapore. 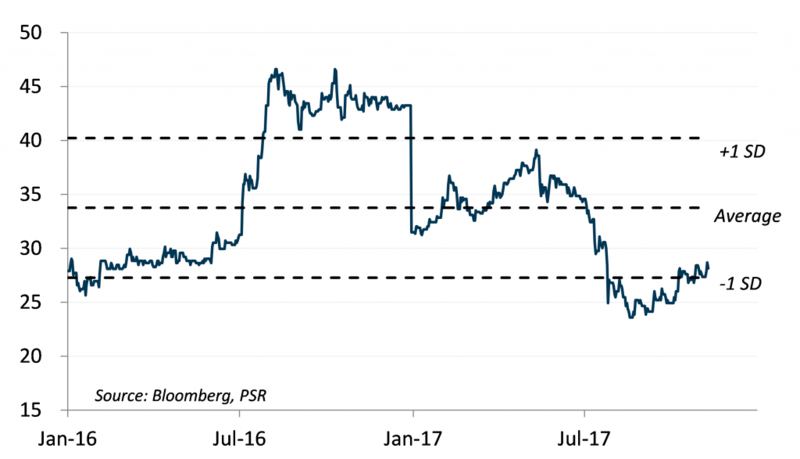 Downgraded to “Accumulate” at lower TP of S$0.62 (previously S$0.65), based on FY18e EPS of 2.15 SCents pegged to forward PER of 29x. We cut our FY17-18e revenue and earnings by 4-5% on slower patient load and margin pressures. These translate to a lower FY17-18e EPS of 1.76 SCents and 2.15 Scents. We are cognizant of the margin pressures arising from sluggish birth rate, slowing medical tourism, higher operating costs and the latent period of the new Paediatric services. Nonetheless, we remain upbeat of the Group’s ability to deliver organic growth. The Group has been actively seeking new recruits of medical practitioners to expand its four growth pillars. Management targets to add 2 new specialists into the Group every year. Better-than-expected margin improvement, particularly its Cancer-related segment after Dr Lim Siew Kuan turned profitable in FY17e. A strong demand for Assisted Reproductive Technology. Expansion into other complementary medical services. SOG is currently trading 28.42x, which is below long-term average of 33.8x.